More than a thousand Scientologists and guests gathered in lower downtown Denver on Saturday, June 16, to celebrate a new Church of Scientology. 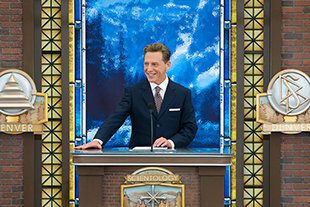 Mr. David Miscavige, Chairman of the Board Religious Technology Center and ecclesiastical leader of the Scientology religion, dedicated the new Church, which will serve Scientologists and the city and county of Denver. Dignitaries welcoming the congregation to their new home were Denver Chief of Police Robert White; Denver City Council Member Albus Brooks; Open Door Youth Gang Alternatives Executive Director, Reverend Leon Kelly; Historic Denver Executive Director Annie Levinsky; and Lower Downtown (LoDo) Neighborhood Association President Josh Davies. Amidst a jubilant crowd, a burst of confetti and a cascading ribbon, the Church of Scientology of Denver celebrated the grand opening of its new home. The historic building adjacent to Coors Field was originally constructed in 1916. It now houses all facilities of a 21st century Ideal Church of Scientology to serve parishioners and the community for decades to come. Scientologists, neighbors, and state and city dignitaries assembled in Lower Downtown for the grand opening of the Denver Church of Scientology Ideal Org. The Church’s new home stands at 2300 Blake Street in the Historic Ballpark Neighborhood, one block from Coors Field. Mr. David Miscavige, Chairman of the Board Religious Technology Center and ecclesiastical leader of the Scientology religion (center right), was joined in dedicating the Church of Scientology of Denver by (left to right): Open Door Youth Gang Alternatives Executive Director, Reverend Leon Kelly; Historic Denver Executive Director Annie Levinsky; Denver Police Chief Robert White; Denver City Council Member Albus Brooks; and LoDo Neighborhood Association President Josh Davies. The new Church of Scientology of Denver stands one block from Coors Field in Lower Downtown’s Historic Ballpark Neighborhood. The Church carefully preserved original features of the restored, early 20th century building, which stands as a renowned example of Denver’s urban revitalization. The fully restored lobby and reception are ready to receive visitors to the Church of Scientology of Denver—morning to night, seven days a week. The Church welcomes all Denverites wishing to obtain an introduction to Dianetics and Scientology. Just steps from reception, the Public Information Center presents a complete overview of every aspect of the religion. The Public Information Center offers more than 500 films, providing visitors a complete introduction to every aspect of Dianetics and Scientology—including the beliefs and practices of the religion as well as a biographical presentation on the life and legacy of Founder L. Ron Hubbard. The Information Center further presents exhibits on the many humanitarian initiatives and social betterment programs the Church sponsors. Visitors are welcome to tour the displays at their leisure for as long as they wish and to return as often as they like. The Chapel is the site of all Scientology congregational services, including Sunday Service, Weddings and Naming Ceremonies. The Chapel also serves as a venue for meetings, conferences and a wide range of community events. The Chapel serves as an ideal venue for civic occasions, including formal banquets. It is also designed to host seminars, workshops and gatherings in the name of community collaboration for the betterment of Denver. The Church’s LoDo style café is open daily for the convenience of parishioners participating in Scientology services and for those visiting the Church. The Church provides for evening and weekend introductory seminars, imparting an overview of fundamental principles of Dianetics and Scientology and their application in life. Scientology introductory services include the Success through Communication Course, which teaches the underlying skill to succeed in both professional and personal relationships. The Church’s bookstore offers L. Ron Hubbard’s scripture on Dianetics and Scientology. Mr. Hubbard’s full legacy comprises tens of millions of published words in dozens of books and thousands of recorded lectures, available in 17 languages. The Hubbard Guidance Center is where Scientologists participate in auditing—Scientology spiritual counseling. Beyond this waiting area are dozens of auditing rooms to meet the needs of the Church’s growing congregation. The Academy is where Scientologists train to become auditors (spiritual counselors), capable of applying the technology of auditing to help others attain spiritual freedom. The Denver Academy comprises multiple course rooms, each devoted to a different aspect of training. Traditional in all Churches of Scientology is the Office of L. Ron Hubbard, honoring the religion’s Founder and symbolizing this Church is true to his writings and ideals. The original American Radiator Company building, constructed in 1916, is now home to the Church of Scientology of Denver. The Church preserved the historical features of the 44,000-square-foot structure during renovation, including the neo-classical entrance crafted from Colorado’s exquisite Yule Marble. The Church preserved the historic façade of the landmark American Radiator Company building, most notably its stately 24th Street entryway of pure-white Colorado Yule Marble. Among the features preserved by the Church during renovation is the original American Radiator Company sign, which has graced Blake Street since the building first opened its doors in 1916. The Church’s renovation carefully preserved the building’s heritage, including the historic 24th Street entry hall with its grand oak staircase and wrought iron balusters. The new home of the Church of Scientology of Denver in the Historic Ballpark Neighborhood, originally constructed in 1916, stands as a renowned example of Denver’s urban revitalization. The Church preserved the landmark building’s many distinctive features, including the skylights added at the turn of this 21st century. In renovation of the building, the Church restored its historical elements, from the fixtures to the exposed brick walls. The Church’s renovation was true to the history of the building, from its early 20th century industrial architecture to its 21st century features. The new Church of Scientology stands at 2300 Blake Street in the Historic Ballpark Neighborhood of Lower Downtown Denver. The building is a prime example of the district’s early 20th century industrial architecture. It was carefully preserved by the Church during renovation and will now serve the people of Denver long into the future. On Saturday, June 16, more than a thousand Scientologists, guests, and state and city dignitaries assembled in Lower Downtown Denver to dedicate a new Church of Scientology. Mr. David Miscavige, Chairman of the Board Religious Technology Center and ecclesiastical leader of the Scientology religion, dedicated the new Church, which will serve Scientologists and the city and county of Denver. The Church stands one block from Coors Field in the heart of the Ballpark Neighborhood Historic District. The building, originally constructed in 1916 for the American Radiator Company, is a renowned example of Denver’s urban revitalization. The Church meticulously preserved the landmark’s original features, including the distinctive neo-classical entrance crafted from pure-white Colorado Yule Marble. Presenting all facilities and services of a 21st century Church of Scientology, the new Denver Church is designed to serve parishioners as well as the city and county of Denver long into the future. The greater significance of the inauguration was prominently underscored by the presence of Mr. David Miscavige, Chairman of the Board Religious Technology Center and ecclesiastical leader of the Scientology religion. Dignitaries joining in the dedication ceremonies were Denver Chief of Police Robert White; Denver City Council Member Albus Brooks; Lower Downtown (LoDo) Neighborhood Association President Josh Davies; Historic Denver Executive Director Annie Levinsky; and Open Door Youth Gang Alternatives Executive Director, Reverend Leon Kelly. The new, 44,000-square-foot Church provides Denver with an introduction to Dianetics and Scientology, beginning with the Public Information Center. Its displays, containing more than 500 films, present the beliefs and practices of the Scientology religion and the life and legacy of Founder L. Ron Hubbard. The Information Center also offers a detailed overview of the many Church-sponsored humanitarian programs—including a worldwide human rights education initiative; an equally far-reaching drug education, prevention and rehabilitation program; a global network of literacy and learning centers; and the Scientology Volunteer Minister program, now comprising the world’s largest independent relief force. The Center is open morning to night for visitors to tour at their leisure and return as often as they wish. The new Church further includes dozens of classrooms and rooms for Scientology auditing (spiritual counseling), while the Chapel seats hundreds for congregational services as well as banquets, seminars and events in the name of community collaboration. 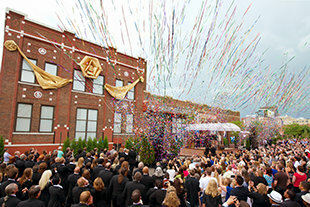 The opening of Denver’s new Church of Scientology marks the fifth Scientology Ideal Organization (Org) to open in 2012. Others opened this year include: the Church of Scientology of Orange County on June 2; the Church of Scientology Greater Cincinnati on February 25; the Church of Scientology Sacramento on January 28; and the Church of Scientology Hamburg, Germany, on January 21. Ideal Orgs realize the fulfillment of Founder L. Ron Hubbard’s vision for the religion. They not only provide the ideal facilities to service Scientologists on their ascent to greater states of spiritual awareness and freedom, but are also designed to serve as a home for the entire community and a meeting ground of cooperative effort to uplift citizens of all denominations. Further Ideal Orgs opened in recent years include Minneapolis-St. Paul, Minnesota; New York, New York; Washington, D.C.; Tampa, Florida; Nashville, Tennessee; Seattle, Washington; Las Vegas, Nevada; Los Angeles, California; Pasadena, California; Inglewood, California; as well as Quebec City, Canada; Mexico City, Mexico; London, England; Melbourne, Australia; Brussels, Belgium; Madrid, Spain; Rome, Italy; Berlin, Germany; and Moscow, Russia. Eight new Ideal Orgs are additionally scheduled for grand opening in 2012.